Little John is not yet 1 year old, and absolutely fond of his iPad. He watches nursery rhymes, cartoons on the iPad. He stops crying immediately if he gets to watch the rhymes. And he doesn’t eat anything without watching iPad. He gets extremely annoyed if the iPad is taken from his hands or if his nursery rhyme stops playing. Rhea is a 3 years old bubbly girl and she loves to play games on her mother’s smartphone. She plays all her favorite games expertly and spends hours on the smartphone.She has learned to download games as well and downloads as amny games as she wants. Do you find these situations familiar? or does it happen in your house? 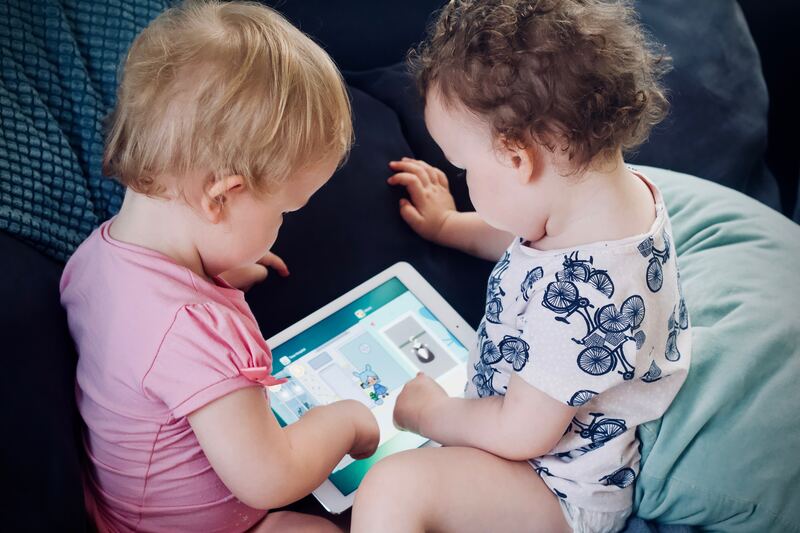 Nowadays the children as young as 6 months old age like watching screens like smartphones, tabs, televisions. Any screen time for young children is not good and it may cause health hazards like Myopia, Concentration disorders etc. Many parents complain about the excessive screen time of their children. But how it started? why did it start? and how to limit it ? are the important questions to solve. There are numbers of reasons behind it like the easy availability of the internet, smartphones, tabs, and unavailability of elders to give time to children. Today we will focus on how to stop it or at least limit your child’s screen time. 1. Avoid giving tab to kids for playing games and watching videos, as it might become a stubborn habit. However cranky a child might be, don’t give a screen. 2. For older kids, It’s best to set a limit for using screens. Decide a time window and give screens only for the designated time. Here we go with the tricks to solve the problems created by screens. Loads of activities and activities can keep your child busy and away from the screens. Check for your child’s interest and If possible send your older than 4-5 years children to activity classes. e.g. Dancing, singing, painting, drawing, swimming. While at home ask your child to do his/her favourite activities. This is the extremely important point. If parents / care givers spend time with children, they won’t go for watching screens. Parents have to set an example by keeping themselves away from screens and spending time with children. During weekdays parents can distribute days in between them and spend that day with children for playing, studying. Art and craft is good entertainment for children and helps to keep them engaged. Buy art and craft supplies like origami papers, beads, threads, ice cream sticks and encourage to make projects. Decorate your house with these cute creations of your child to appreciate them. (Thousands of videos on art and craft are available on YouTube. Select a simple according to your child’s age). Best way to refrain children from watching screens is to make them play more. Children of all age like to play, so play with your children as and when possible. Plan play dates with other children and encourages to play. Take your kids outdoor, playgrounds as much as you can. Play badminton, cricket, soccer, tennis like sports with them. Playing outdoors help them in physical and mental development and have a healthy lifestyle. The even unstructured play is extremely helpful for growing children. Encourage them from a young age to play outdoor sports. Here comes an interesting part for mommy. If you could get a little helping hands for doing the household chorus, it’s great. If your child is older than 3-4 year old start assigning small tasks to keep them busy. E.g. Arranging toys, folding small clothes Packing school bag. It will help them to be independent and responsible. They will learn doing their own things from a young age. Now a days this issue should be taken in a serious way. Very helpful post with logical suggestions.